Sometimes walls are an obstacle. Sometimes they're not. 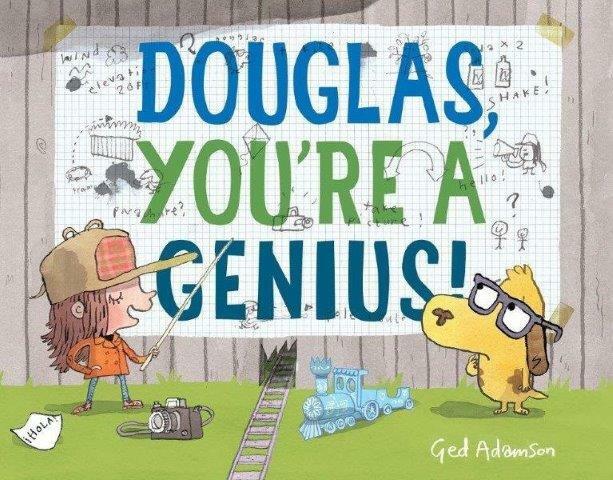 Here are three different takes on walls in recent picture books. Nancy and Douglas were playing ball in the backyard, when Nancy hit one too hard. The ball disappears through a hole in the fence. Oh, no! And then it comes back. Thank you! Douglas wants to know who is over there, on the other side. So they lay track and send a message by train. And then they wait. What I like about this book: When the message comes back it's ... escrito en español. Now they really want to find out who lives on the other side of the wall. Nancy comes up with all kinds of plans - some involving trampolines, bungee cords, even a kite. Then Douglas has an idea, and it was the most genius plan of all! I also like the brilliant plans, drawn on graph paper, and how the characters work together as an "engineering team". And I like the Spanish glossary at the front, so readers can familiarize themselves with some of the phrases used, such as "queremos conocerte" (we want to meet you). I started wondering how many kids' books feature walls. Turns out this is becoming a theme in some picture books. 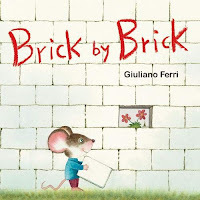 I really like Brick by Brick, by Giuliano Ferri (Minedition, 2016). Giuliano is an author-illustrator who lives in Italy. But no translation was needed for this book, because Brick by Brick has no words. At the heart of the story is this question: what happens if a brick falls out of the wall? And then you and your friends take out more bricks... and what could those bricks be used for instead of building a wall? From the jacket: "...walls can become bridges when everyone pitches in." And that, right there, is What I like about this book. In picture books, walls can show up in totally unexpected places, and sometimes overnight. Deep in the forest something wasn't right. Overnight, a wall had appeared. Plus there were posters tacked to the trees. They had messages such as "Be More Badger!" and "Badgers are Best!" Of course, Badger is the one who put up the posters. And now he's in charge of making sure that the animals who live on his side of the wall are sufficiently badgerly. 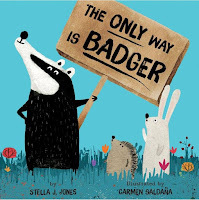 What I like about this book: Badger thinks his way is best, so he devises tests to weed out animals that aren't badgerish enough. Can't dig like badger? To the other side of the wall with you! Too big to fit in a badger den? Over the wall with you, too! But soon... there's no one left on badger's side of the wall. Plus it's deadly boring. So badger climbs up, up, up, and peeks over the wall to the other side. And then he makes the best sign of all (which I will NOT reveal) - suffice it to say that badger learns to appreciate his diverse friends. Some walls create habitats. 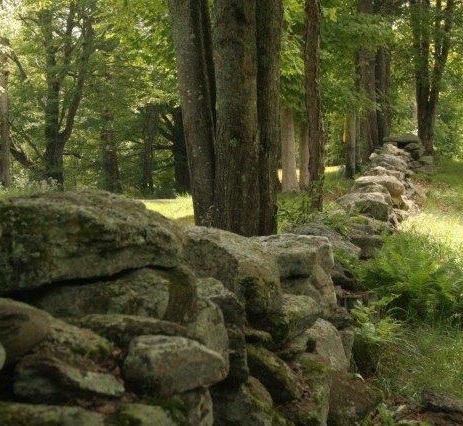 In some places in the northeast I find old stone walls meandering through the woods or along the edges of fields. The stones are so old that they are covered by lichens and mosses. Sometimes grasses and other plants have taken foothold, and insects and other tiny creatures have built their homes in the nooks and crannies of the wall. Over, Under, and Around... When I was a kid, everyone in our neighborhood had wooden privacy fences along the border of their back yards. Like Douglas and Nancy, we always wanted to find ways to the other side - even though we already knew everyone on the block. We thought of crazy ideas, too: bouncing someone over using a teeter-totter was one. Put your best engineering skills to use and design a way to get to the other side of a wall. Hint: drawing on graph paper makes it more fun! Can you use walls to make art? Street art - painted murals and mosaics - are a highlight of my visit to Ithaca, NY. Check out this review of Hey Wall: A Story of Art and Community posted by Patricia Tilton. We're joining Perfect Picture Book Friday. 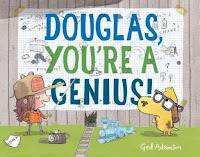 It's a weekly event where bloggers share great picture books at Susanna Leonard Hill's website. Review copies discovered at the library. Why am I not surprised that there is another PPBF post about picture books with walls today??! I love the sound of all these and wonder if I can interview Giuliano? Great idea, Johanna - I think an interview would be marvelous. His book is so inspired! and inspiring. These all sounds wonderful. I especially love the jacket copy from BRICK BY BRICK, ""...walls can become bridges when everyone pitches in." Yes! can we make it happen in our lifetime? Love the wall theme! I haven't read any of these. Will do so pronto! Thanks for the recs! Four PBs shared today about different kinds of walls. Timely. My guess is we will se more this year! Enjoyed the ones you shared! I am so happy that picture book writers have found ways to talk about walls .... without talking about THE wall. Interesting story and wall theme. Thanks forsharing. Great way to tie all these books and activities together. I hadn't seen some of these. Yeah, more books for the library list!